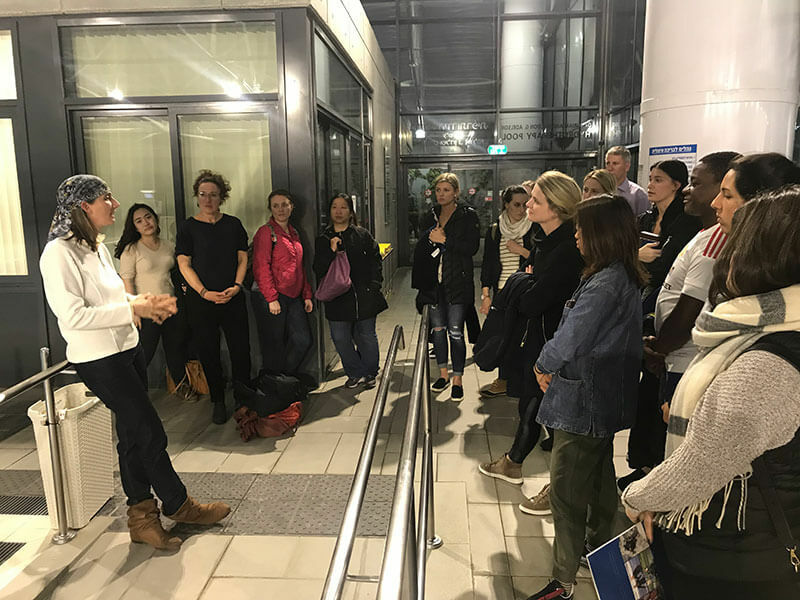 The group of graduate students were in Israel on a ten day visit during which time they were studying the theme, Disability in a Global Context. The students come from a variety of academic disciplines, including physical therapy, occupational therapy, special education, childhood education, communicative disorders, and more. With Dvorah Billauer at the Hydrotherapy Pool. Discuss the context and life experiences of people with disabilities living in Israel. Analyze the historical and political influences that established rehabilitation services in Israel. Observe and appreciate the various programs for children and adults with disabilities. Compare various rehabilitation approaches observed in Israel to those offered in the United States. They had an exciting experience watching a wheelchair basketball practice, heard an in depth explanation on the Hydrotherapy Treatments offered at our Beit Halochem centers by Dvorah Billauer, Director of the Hydrotherapy Programs at ZDVO and its BH centers carried out a very candid Q & A session at the end of the visit, hosted by Ora Seidner.